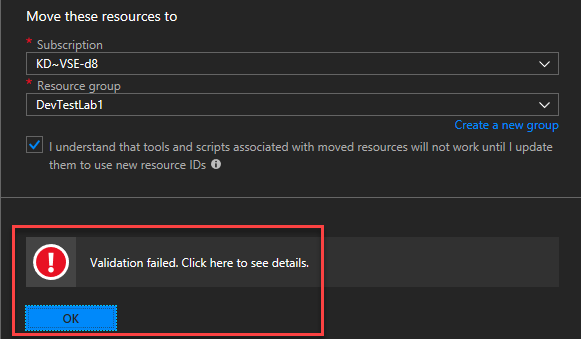 At the time of writing this, moving/migration of VMs with managed disks to a new Azure Subscription, is not supported in Azure. It is possible however, to move managed snapshots of a VM’s vhds to another Azure subscription, and then ‘reconstruct’ the VM using the OS and data disks snapshots or managed disks. The VM object itself is just metadata running the vhds (The Move option for both snapshots or managed disks displays in the Azure portal, but we found that the portal Move option does not work for our various Azure Accounts and Subscriptions. (See screen shot below).) The Move operations of snapshots or managed disks can be done easily via PowerShell. 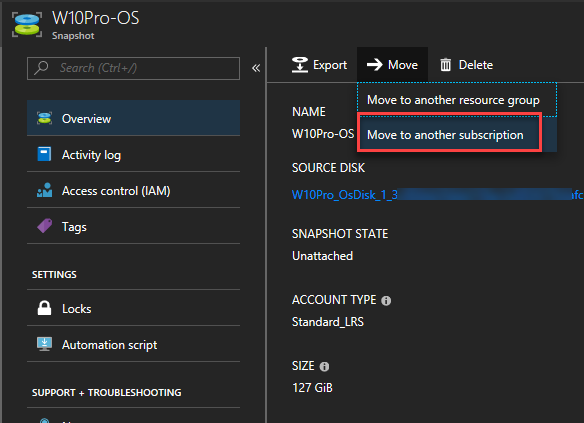 Why move managed disks to another subscription? For example, once a Dev/Test environment is proven, the typical procedure is to migrate the IaaS infrastructure to an Enterprise Subscription for a production environment. Also, moving copies of snapshots out of the main subscription is beneficial for data retention in case of Disaster Recovery or accidental deletions. 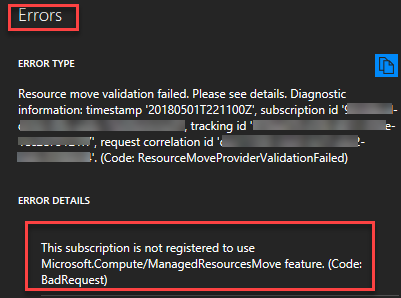 While the option to Move to another subscription is shown on the snapshot blade, validation of the process failed giving the error that this subscription is not ‘registered to use Microsoft.Computer/ManagedResourcesMove feature…but a snap shot can easily be copied to another subscription via PowerShell. One question, when snapshot has been transfered, I’ve created a disk. But on this disk, I haven’t the button “+ create VM” (I’ve this button if the snapshot has not been transfered). So, the question is, how can I restore the VM from a transfered snapshot ? I’ll make the assumption you’re working with a managed snapshot and a managed disk was created from the transferred snapshot. If the ‘+ create VM’ option in the portal isn’t active, then you will need to use PowerShell to ‘restore’ (meaning you’re actually creating a brand new VM from the managed disk) the VM from the newly created managed disk.